I am not sure about you, but I can not stand leaf blowers. The concept does not work for me in any way. Now if you live outside the US, or in a region that has sane laws restricting or prohibiting the use of such evil devices, you may not know what I am referring to. 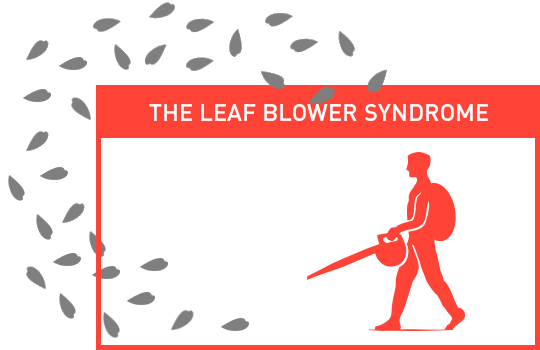 The concept is simple: Leaf blowers use high pressure air, like a fan or hairdryer on steroids, to move leaves from one area to another, most often this means your gardeners blow them to your neighbors, or onto the street. Problem solved? Not quite. Either your neighbor hates you now (even a bit more), or the wind blows them back to you, eventually. Solution? Have the leaf blowers come by more often. Leaf blowers postpone an issue, while displeasing everyone who gets in touch with them. It stinks up the neighborhood, is annoyingly noisy and pushes a problem from one place to another. Bingo! Out of sight – out of mind. Now that was quick and cheap. Consider those massive amounts of leaves handled. On my way to our office last week, my thoughts deeply entrenched in the world of branding (as you’d expect), leaf blowers pushed their leaves smack onto a busy street during rush hour traffic. As I passed them I saw those leaves go absolutely everywhere; mostly right back to where they came from. It made me think of all these startups saving money bootstrapping (Hint: ’99 Designs Dot Com’) – now read these two words carefully – their identity by crowd sourcing it to strangers to create cool designs. They will not arrive at a solution easily, so they get more leaf blowers to work faster and more often creating vast amounts of different logo designs, spending hours over hours discussing the designs they receive in their Inbox until they need to just pick the one they ‘like’ best. A couple months later early brand adopters gather and success hits. The wind has changed, the leaves are coming back. This is the point in which they realize that the logo is not their real identity. It does not connect. It is missing meaning. It does not have nor create a story. They need to re-brand, even though they just spent all that time and energy, and by now even a sizable expense. And this time it is going to be much more costly then had they done it right from the get-go. They have to re-educate their customers, hire a specialist whom they pay professional fees like they do with their other consultants. They need to re-create all touch points from the web site via all the collateral to perhaps even the signage. It stinks. If you ask successful startups what they would have done differently in retrospect, many say they wish they had not cut costs on their initial branding or web site efforts. The wind changes, the leaves come back, but at that point the neighbors already like you that much less and making up is hard to do, a much lengthier process that involves other ‘leaf-behinds’ (sorry, I just had to!). I recall my parents picking up leaves in batches in our garden and carrying them to the compost to get rid of them. Now that makes a whole lot of sense. It definitely was a time investment, but only a one-time investment. It even had a romantic part to it. It showed they cared and that the seasons were changing. Pick up the pieces, make sense of them, do it with love, and it will show. Just remember, it’s your startups identity. I’m an advertiser/ graphic designer, and I run into this often. Logo design/ branding is a science. There is a lot of research and testing that goes into an effective logo. Just the colors chosen can change how people view the brand.